Cavapoo Characteristics: The fun-loving and faithful Cavapoo is a breed of Small to Medium dog is a Hybrid / Mix crossbreed, bred from the Cavalier King Charles Spaniel and the Poodle. The Cavapoo, is characterized by its lovable, compact appearance with its distinctive large, adorable eyes, round face and long, floppy ears and gentle expression. This "designer dog" hybrid breed exhibits the combination of characteristics, and a temperament mix, associated with the Cavalier King Charles Spaniel and the Poodle. The goal of crossing the two breeds was to create 'Cavadoodle' puppies that incorporated the gentleness of the Cavalier King Charles Spaniel with the high intelligence and non-shedding coat of the Poodle. The temperament of the Cavapoo can be described as Playful, Sociable, Loyal. The coat type of the Cavapoo is described as varied coat type depending on hereditary traits in assorted colors. Due to its characteristics and qualities, the Cavapoo demonstrated the desired traits of a Watch dog, Companion and Pet dog and is known by its nick name the "Cavoodle". The origin of the Cavapoo dog breed was in United States where it was developed in the mid to late 1900's. Cavapoo Dog Type - Hybrid / Mix (Unrecognised as a breed): Cavalier King Charles Spaniel / Poodle: The Cavapoo is one of the many types of dogs described as a Hybrid / Mix, bred from the Cavalier King Charles Spaniel and the Poodle. Other names for the Cavapoo: The Cavapoo is known by the nickname of the "Cavoodle". Other names for this breed of dog include the Cavoodle, Cava-Doodle and Cavipoodle. Cavapoo History and Origin: The country of origin of the Cavapoo breed was in United States during the mid to late 1900's. The lineage of the hybrid Cavapoo is a combination of two dog breeds. The Cavalier King Charles Spaniel, the "Merry Monarch's Dog", originated in Great Britain as a Bird Flusher and lapdog during the 1600's. The Poodle, the "Caniche", began as a water dog, specifically as a duck retriever, in Germany during the 1500's. The goal of Dog breeders was to create a new type of dog that had the appealing looks and the gentle nature of the Cavalier King Charles Spaniel with the super intelligence and low shedding coat of the Poodle. The innovative breeding program resulted in the Cavapoo dog. The Cavapoo was a great success, especially with families, and able to adapt to any environment and was happy to live in an apartment. The qualities of the adaptable Cavapoo was found to be highly trainable and was both dog and cat friendly. The sociable Cavapoo was found to get on well with older, more considerate children and had no problem socializing with strangers. The characteristics of the Cavapoo also made the dog popular with health professionals led to the Cavapoo becoming a successful therapy dog. The cross-breed Cavapoo is currently recognized by the Designer Dogs Kennel Club (DDKC) and the American Canine Hybrid Club (ACHC). Cavapoo Height: This breed is classified as a Small to Medium sized dog. The height to the shoulder of a male dog is 9-14 inches(23-35cm). The height to the shoulder of a female dog is slightly less. Cavapoo Weight: In the Small to Medium sized Cavapoo dog, the weight of a standard male dog is 7-18 pounds. The weight of the smaller female dog is slightly less than the male. Cavapoo Coat Type - LOW shedding coat: The coat type is described as varied soft coat type so the Cavapoo coat can therefore be short or long soft or silky hair that can be a loose wavy coat, a tighter curly coat or a straight coat. Cavapoo Coat Colors: The colors of the popular Cavapoo dog breed consist of assorted colors consisting of black, gold, white, chestnut and white, or tri-colour (black, white and tan). Cavapoo Grooming Requirements: The grooming needs of the Cavapoo is dependent on the type of coat it has inherited from its parents, either the Cavalier King Charles Spaniel or the Poodle. The Cavalier King Charles Spaniel has high grooming requirements and so does the Poodle, so this dog can be expected to be high maintenance. The grooming needs and requirements should include bathing the Cavapoo dog on a monthly basis and making regular checks of the teeth, nails, eyes and ears. Cavapoo Litter Size: The litter size of this dog breed ranges from 3-8 puppies. Cavapoo puppies for sale can be obtained reputable breeders and from rescue centers. The cost of Cavapoo puppies varies depending on location, pedigree history and the dog breeder. Cavapoo Temperament and personality: The temperament and personality of this popular dog breed is described as Fun-loving, Playful, Sociable, Loyal and Faithful. Cavapoo Exercise Requirements - MODERATE Exercise Requirements: The exercise requirements of this breed of dog are moderate. The Cavapoo requires regular daily exercise consisting of 30 minutes to one hour every day, depending on the size of the dog. The medium sized Cavapoo has a strong, fluid gait with strides of a moderate length requiring a steady walking or jogging speed by the owner to meet the dogs exercise requirements. If the dog has more energy than you do, then teach your dog to play ball in a chase and catch game. Cavapoo Diet: A fully grown Cavapoo should be fed twice a day. A diet consisting of a premium dog food can be balanced with fresh food eaten by the family. The question is What Can Dogs Eat?. Check out our comprehensive list of what dogs can and what dogs cannot eat. Cavapoo Health Problems: Potential health problems of the Cavapoo breed have not yet been fully established, but there is the possibility of inherited, genetic health issues. Resolving health problems can prove to be expensive and it is always wise to obtain pet insurance or dog health insurance when buying a dog. Is the Cavapoo dog breed said to be Hypoallergenic? Answer: Yes (Refer to Hypoallergenic Dogs). 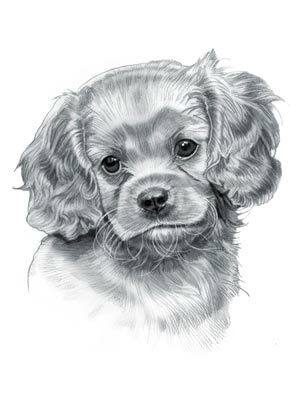 Cavapoo Lifespan: The life expectancy of dogs vary according to the size, breed of dog and any serious health problems. The typical lifespan of the Cavapoo breed is 10-15 years. Cavapoo Male Dog Names: Male Dog names are most often chosen to reflect favorite names of the owner or the strength, size, coloring and country of origin of the Cavapoo breed. To give you some inspiration regarding good male Cavapoo names our small selection might be of help with naming boy dogs. Our top male Cavapoo dog names are: Gus *** Diesel *** Bandit *** Jasper *** Gizmo *** Shadow *** Marley *** Rocco *** Rufus *** George *** Bruno *** Jax *** Romeo *** Rex. Cavapoo Female Dog Names: Female Dog names tend to be softer, prettier and reflect the temperament of the Cavapoo girl dog. Our top choice of good female Cavapoo names are Dixie *** Angel *** Layla *** Roxie *** Pepper *** Missy *** Maya *** Phoebe *** Belle *** Riley *** Piper *** Cookie.